Circus performers have a special stage in the Circus Circus Midway area. 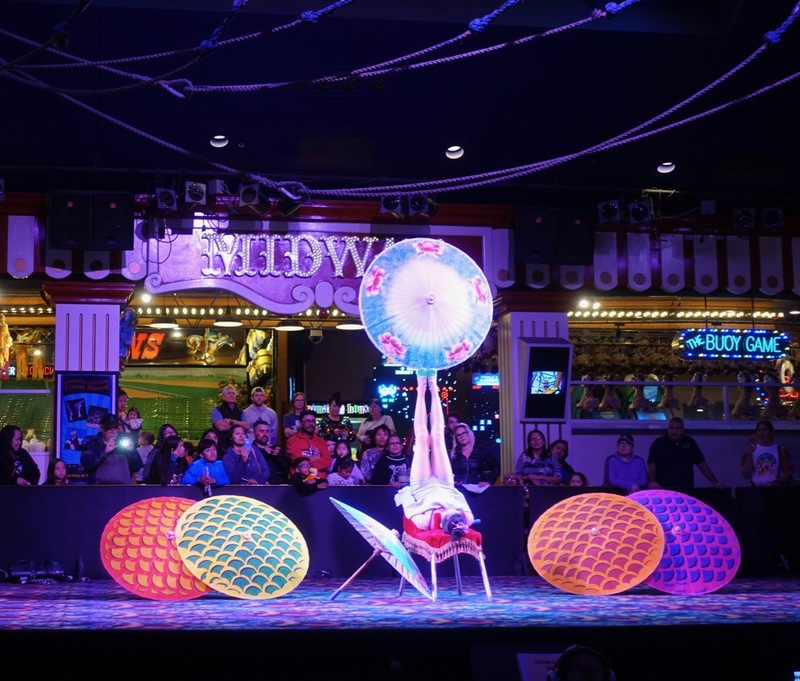 Here a Chinese acrobat shows how she can handle, with her feet, Chinese umbrellas. Last week as I was driving down Las Vegas Boulevard, I noted the Circus Circus sign…and it looked particularly beautiful that night. The sign gave me an idea: I hadn’t visited Circus Circus in probably 15 years, so maybe a video tour would be in order. But wait…a bit of internet research said that Circus Circus’s location was “Winchester, Nevada”. What? Come to find out, Winchester (population 27,000), like Paradise, Enterprise, Spring Valley, Sunrise Manor and Whitney, is an unincorporated town that is part of Clark County, Nevada. (I had simply never heard of Winchester.) Residents of unincorporated towns in the Las Vegas valley have Las Vegas addresses, but are technically not part of the City of Las Vegas. So yes, because of Circus Circus I learned about Winchester. My walk inside the Circus Circus building is seen in the attached video. I did not see the indoor amusement park, Adventuredome, because Adventuredome is now only open on weekend nights and I visited on a Thursday evening. I have a few other observations because of my visit. The casino is old (it opened 51 years ago, in 1968), but I noticed no musty smell, and everything looked tidy — if not particularly luxurious. The ladies restroom I visited was no frills, but appeared very clean. Though Circus Circus is an MGM property, the player’s card that one uses at the other MGM properties doesn’t work at Circus Circus. A special Circus Circus player’s card is required. The elevated Circus Circus Midway area is impressive in terms of its size. Games of skill with prizes and a video arcade, entertainment for folks of all ages, are available as is an area to watch free circus acts. Bright lights and sounds are everywhere. Lots of shopping is available at Circus Circus as well, so for families, money for souvenirs should be set aside as well as money for Midway games and Adventuredome experiences. With regard to gambling (and yes, plenty of slot machines and table games are available), I did sign up for a Circus Circus player’s card and punched buttons at a slot machine for about 30 minutes. My profit was 37 cents. Circus Circus has a large RV park as well as its five-acre Adventuredome. (Check the Adventuredome web site for hours of operation.) I did look at room rate prices and for a Strip location, the rates (add a $27 plus tax resort fee) are reasonable, However, I suspect the room decors at Circus Circus would not be confused with rooms at the Wynn or Bellagio. And it’s been at least a decade since I was in the Circus Circus too — Enjoyed the video! Thanks Diane. Great to see what they offer here.